A freakin flower pot! I was like WTF no way really? So with that in mind he continued to show pictures of how this little pot of clay can produce such awesome results. I was SHOCKED. Here is what i did. 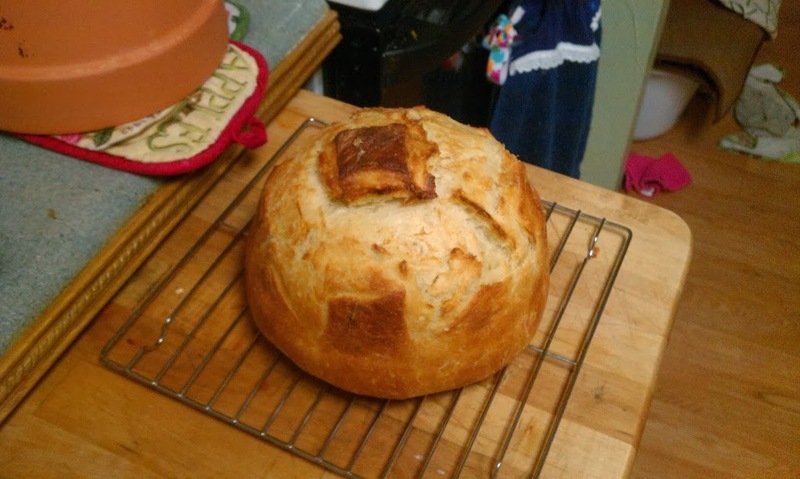 I started off with my recipe for the basic boule. Once i mixed the dough,by hand i might mention, i let it rise till double. That took about an hour since i was using that fast yeast. Once doubled, i shaped and placed onto a corn milled pizza peel, which is the best tool ever, and let rise till double. Once it has risen to the level your want, slash it if you so desire. The pot i used is roughly 8-10 inches in diameter and stands about 10 inches tall. Only cost 5$ or so. I will tell you this, it does take a few hours for the pot to cool off so handle with care. Here are the finished results of the bread cooked in the pot. Please enjoy and have fun making it. I know i did.